This quietly unsettling novel combines past and present, dreams and reality, into one strange hotel mystery. In Travelers Rest, Keith Lee Morris (Call It What You Want) strikes the perfect balance between the real and the fantastical, resulting in a novel whose mystery is as disquieting as it is mind-bending. As the Addison family drives across Idaho, a fierce snowstorm forces them off the highway in search of a place to stay. They wind up at Travelers Rest, a beautiful but decrepit old hotel in the town of Good Night, with unfinished lobby renovations, a strange hotel manager and a remarkable absence of other guests. While Julia and her husband, Tonio, settle into their room with their precocious 10-year-old son, Dewey, Tonio's brother, Robbie, leaves the hotel to find a stiff drink at the bar across the street--his first since his most recent stint in rehab. When Robbie fails to return, Tonio goes looking for him and finds himself lost in an endless alley of snow and cold. Julia wanders into Room 306, for which she is startled to find she has the key, and discovers a restful, lulling kind of peace there. As each of the adults at once remember and forget that they should be looking after Dewey--who is left to his own devices in the crumbling old hotel in an eternal snow--the world of past and present, dream and waking merge into one. 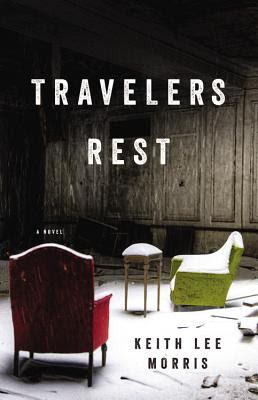 Morris excellently builds the slow-burning mystery of the hotel's past in a way that will leave readers lulled into the strangeness of Travelers Rest just as they are discomfited by the eeriness of it all. Galley provided by the publisher for review.